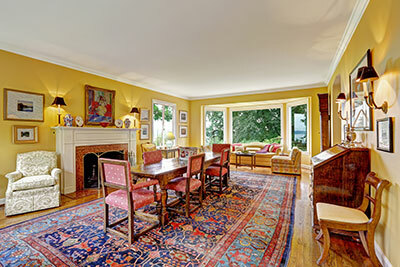 Oriental rugs, Persian rugs, dhurries, silk rugs, area rugs, runners, braided rugs and custom cut padding—You should only entrust these valuable treasures to an expert rug cleaner. At Palm Beach Oriental Rug Cleaning Pros, our experts are knowledgeable and experienced professionals you can trust in Piper’s Landing Yacht & Country Club. Before the cleaning begins, our Oriental rug cleaning technicians thoroughly inspect the rug for tears, holes, missing yarns in the face, damaged fringe, pet or insect damage and unstable dyes that are bleeding or could bleed into other areas of the rug. At this point, a dye test is performed on every color in the rug to insure stability. Potential problems are discussed with you before cleaning ever begins. How much of the rug is inspected? All of it: The whole body, the edges and the fringe, too. Soil removal is the next step—soil that ordinary vacuums can't remove. The Oriental rug is inverted over a protective grid then vibrated with a special machine that pushes soil particles and dust out of the rug fibers. The dirt is removed before cleansers are ever applied. This prevents massaging the dirt deeper into the rug. Our process thoroughly vibrates the rug from the back, thus allowing these fiber damaging impediments to fall free from the rug to be vacuumed. After the dry soil removal stage is completed, special detergents are used to carefully hand-wash the rug. We begin by completely wetting down rug front and back to loosen soil and deodorize. 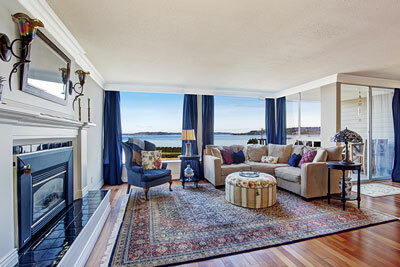 We use a low speed rug cleaner with specially formulated detergents for Oriental rug cleaning. Once all of the insoluble dry soil has been removed and the wet soil extraction process is done, it is time for the rinsing phase. We have created an indoor river process to completely flush the soil and detergents out of the rug. This is done by continuously removing the dirty water and rinsing with fresh, clean water. Any pet urine will be flushed down the drain at this time. The rug is flushed with cold water on both the front and backsides several times until the water runs clear. 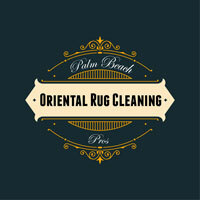 At Palm Beach Oriental Rug Cleaning Pros, one of the final steps in our rug cleaning process is a highly developed water extraction technique. Once all the washing is complete, it is time to extract as much water as possible and to dry the rug as quickly as possible. With this method, we can ensure that your rug dries in a matter of hours. This is critical since we know that rugs will mildew, dye bleed, and rot if left wet for extended periods of time. The fringe detailing and final inspection are the last steps in our Oriental rug cleaning process. First, fibers are inspected and "groomed" to set the nap in the direction it was originally knotted. For rugs that have fringes, we clean and detail these after the initial drying process is complete. These are cleaned and groomed using detergents and non-chlorine bleaches to thoroughly clean and brighten worn and dingy fringes. After a final stay on our drying racks for four to six hours, a final inspection is done on the rug. This includes looking for any missed spots; odors, dye bleed, and re-check for dry soil removal that was done in step two. Assuming the rug has passed this inspection process, we package and label the rug and make ready for delivery back to your home or office in Piper’s Landing Yacht & Country Club.